Divers Supply is committed to 100% Customer Satisfaction and we appreciate all of our customer's input and suggestions. For Fast Service: please click the Live Chat at the bottom right of the screen (if not online leave a message and we will get back to during normal business hours). 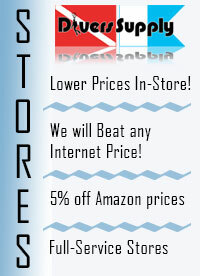 Divers Supply has 4 full retail stores and a world wide mail-order/internet team. For a list of all our locations and hours of operation Click Here.